Nick Hand, cyclist and founder of Bristol’s The Letterpress Collective and bicycle designer Robin Mather, from The Bicycle Academy, discuss their recent collaboration The Printing Bike Project, involving building a custom made bicycle which they rode to Mainz in Germany – the spiritual home of the printing press - whilst carrying out en-route this beautiful and artistic trade. In 2013 Bristolian Nick hand set up The Letter Press Collective to teach people how to compose and create work using traditional printing press techniques. His friend Robin Mather designs and builds beautiful bicycles at the Bicycle Academy based in Frome. The Printing Bike Project brings together both Nick and Robin's interests and skills to recreate what would have been common in Britain not so long ago. A bicycle designed to travel long distances and carry out a trade. 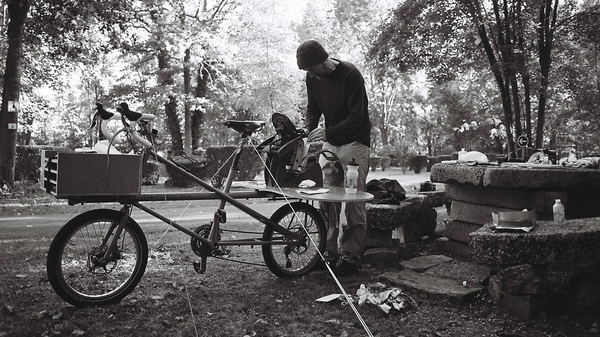 In this illustrated talk Nick and Robin discuss the project, show some of their work they produced on the road and demonstrate how adaptable and productive the bicycle can be. In celebration of Bristol’s affection for the bicycle, Cyclescreen returns to Watershed with an exciting programme of documentaries and talks featuring some of the leading filmmakers and authors from cycling culture.